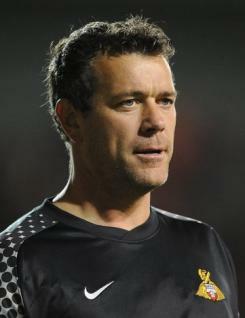 Experienced goalkeeper Neil Sullivan has been with Doncaster Rovers since signing permanently in the summer of 2007 after two loan spells. He had previously played most of his career in the Premier League, notably with Wimbledon and Tottenham Hotspur. Neil gained 28 full caps for Scotland between 1997 and 2003, and was a member of the Rovers team that won the Johnstone's Paint Trophy in 2007 and the League One play-off final in 2008. After his run of 137 consecutive League starts had ended in the final game of 2009-10, Neil started the 2010-11 season as Rovers' first choice goalkeeper and played in 29 games before injury forced him onto the sidelines. He then found his place taken by Gary Woods, although he did make two brief returns to first-team action. Neil's agility continues to belie his age and he was offered a new contract for Rovers for 2011-12.